So, Emily’s softball season is about to begin (tomorrow night!). She’s been playing for about 5 seasons now in Texas and California. She’s been blessed to have some great coaches, who volunteer their time and work on them. In fact, this season, Emily has 3-4 days out of the week where she has practices and games #fulltimechauffeur. It’s also great that technology is used to help her get better. 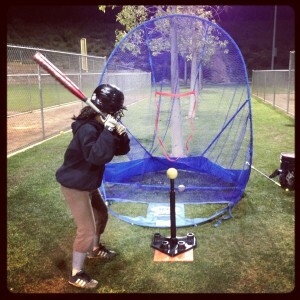 This is a video of her coach encouraging and correcting her swing. Last week, I took her to her normal batting practice where she has 1-on-1 time with the coach, and after the session, he took his iPad out and recorded her swing. That night, I got this video. Wow, that’s awesome! You see the coach knows that feedback and encouragement is necessary for growth. That’s true in everything that we do. I thought about that in my world. As I have the privilege of creating and designing our Sunday services with our team, it’s a reminder that we need to continue in evaluating to grow and get better. That’s why every week, we go into much detail (sometimes painful detail) in how Sunday went. That’s why we evaluate every event and celebrate the wins in every program. That’s why, even though it’s very painful for me, I watch myself on video of me preaching … so that I can grow. Because it makes a difference in getting better. Because our God desires the best. As I take a step back and see Emily play, I’m amazed at how she’s just gotten better and better. And even though I can be my worst critic, I know that God’s using everything to grow me and what I get to be a part of. How do you evaluate and get better at what you do?